After the longest stage of the 2012 Tour, over 226km and almost six hours of racing, the wait had come to an end for David Millar (Garmin-Sharp). He had himself another stage victory at the Tour de France, his fourth as an individual. But the wait was so much longer than that. It was nine years and a lifetime ago since Millar’s last victory at the 2003 Tour de France. He crossed the line and punched the air, overcome with emotion. There was a lot being said in that finish-line gesture, though much of it may not have been obvious. But his statements just after the stage were markedly more blunt and characteristic of the Scot. Millar was eating in a restaurant near the resort town of Biarritz on June 23, 2004, when he was approached by policemen from the Paris drug squad. He was arrested for possession of doping paraphernalia after they found empty vials of EPO and two used syringes in his pockets. Millar eventually confessed to police the next day; he admitted to using EPO in 2001 and 2003. Under UCI rules, a confession equated to a positive test. British Cycling suspended him for two years in August of that year. He was disqualified as the 2003 world time trial champion. His team, Cofidis, fired him. He had lost all that he had as an athlete. In fact, he described it as much worse than that in an interview in 2006. His road to redemption was eventually paved with argyle. At the start of the 2008 season, Millar took on part ownership of the Garmin-Slipstream operation — with its trademark argyle kits under the leadership of the sideburned Jonathan Vaughters — in order to foster their anti-doping stance. It was a team built on a clean image, with clean racing at its core. So, to return to that gesture, he owed a lot to this team, and not just for giving him a place again within the peloton. Millar used the team, and his place on it, to set an example that clean racing can be winning racing. In 2010, Millar matched his best clean placing at the world time trial championships, finishing second behind Fabian Cancellara. Shortly after, at the Commonwealth Games, he won a gold medal in the time trial and a bronze in the road race. Though it seems he’ll never want to hide the past completely — once an ex-doper, always an ex-doper — the emotion we saw from Millar as he crossed the line had as much to do with his long road back as it did with his team’s thus-far catastrophic Tour run. 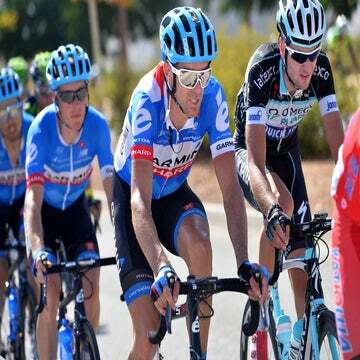 The team has suffered more than most at this edition of the Tour, with its loss of Ryder Hesjedal and Tom Danielson and the many injuries to its other riders. Compare that to last year when it shone incredibly brightly: Garmin won the team time trial (making five the number of stage wins overall for Millar in his Tour career); three stages, one with Tyler Farrar and two with Thor Hushovd; and took the overall team classification. What a difference a year makes.